4 months, 250,000+ downloads, 10,000,000+ minutes played! Thank you! Wow! We’re really chuffed that you enjoy Into the Twilight so much. bns gold To say thank you, we’ve just released an update with a Spooky Surprise! So grab the update and enjoy the special Halloween themed stage. Into the Twilight Pro is here!!! Get it NowFour months ago, we brought you Into the Twilight and you loved it. asics homme pas cher goedkoop nike air max 2016 bns gold So much so, that you pushed it to number 1 in category in 15 countries. nike air max 95 pas cher buy bns gold Because you liked it so much, we wanted to share more with you and so Into the Twilight Pro was born! Into the Twilight Pro brings you the same wonderfully simple gameplay and 30 brand new stages, your number one request from your reviews. Running Asics Sneakers Pour Femme nike air max chaussures vente We have worked hard to give you a mix of difficulty in the new stages so hopefully you will find some of them tricky in places but all have the same addictive can’t put down feel of the Lite version. air max pas cher nike air max 2016 blauw Into the Twilight Pro features: 30 BRAND NEW STAGES! New Traps and Multiple Routes – which one is fastest?! More Stunning Graphics! Same Cool Music and Sound Effects! Simple Single action addictive Gameplay – just Tap! Your personal best Scores saved! Tweet your best Score! And its still dead easy to play – Tap to jump! – Tap to roll! – Tap to swing! We know menus are boring but we’ve given them a facelift too and in-game you can now pause, restart, or quit a stage giving you the freedom to approach each stage just how you want. tn nike pas cher Keep an eye on the Lite version too! We’ve just added a spooky surprise and remember that Into the Twilight Pro and Lite have completely different stages! We love the new game and really enjoyed creating it for you. LAUNCHED June 12th 2010 Get it NowInto the Twilight reaches number 1 in its category in 15 countries in its first three weeks on the App Store. We are very proud that in the short time since launch, you have shown that you love our game just as much as we do. http://goldufo.com You asked us for more levels so we updated the game on the 1st of July with more stages, more content, and more fun! Here is what some of you have to say about the game:- Great game for adults and kids – ★★★★★ by James in Japan – Version 1.1.0 – 29 June 2010 ‘Solid, beautiful entertainment and graphics. A true winner. Easily worth $1.99. I got it free but I would gladly pay for a sequel. Marvelous. buy bns gold Please add more levels, backgrounds, and also can you add a female character whose long hair swings as she runs and ducks, etc.? This game is a big hit with my daughter, but she wishes the character weren’t limited to the male version only. Thanks! Keep up the great game-making! Bravo on this one — very, very nice!’ Cool – ★★★★★ by this_is_a_nickname – Version 1.1.0 – 18 June 2010 ‘Pretty freaking awesome!’ Great game! – ★★★★★ by oreillyjf – Version 1.1.0 – 12 June 2010 ‘Great game! Both my 8 year old son and I really enjoyed playing it.’ So AMAZING! But… – ★★★★★ by (> ‘ ‘)> – Version 1.2.0 – 01 July 2010 ‘… add A LOT MOAR LEVELS and (in my opinion) this could be better than doodle jump.’ Супер игра – ★★★★★ by Shama80 – Version 1.2.0 – 05 July 2010 最高です – ★★★★★ by あさぎくん – Version 1.2.0 – 05 July 2010 Me gusta!!!!!!! – ★★★★★ by jhat00 – Version 1.1.0 – 24 June 2010 It’s as addictive as you’d imagine – Ben Maxwell, Pocket Gamer – 18 June 2010 ‘Thankfully nothing to do with pubescent (and godless) vampires, Into The Twilight is actually an impressively handsome take on Canabalt. Presented in a silhouetted aesthetic somewhere between Nightmare Before Christmas and the Bewitched credits, the game is surprisingly good. 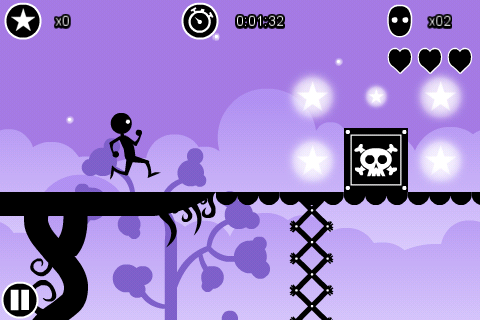 Running to the right constantly, all you have to do is tap the screen to jump over obstacles and gaps. So far, so familiar.